﻿ E-ink-Reader. E-reader reads aloud. I think, almost every fancier of books knows such situation, when to the end of an interesting book remains little, but you have to do something when your eyes and hands are busy. It's a shame, annoying but solvable! You will be read to by your electronic book. Yes-yes, your ereader. the programme Cool Reader for devices on operating system Android has an item of menu - "Read aloud". The programme uses external module TTS - Text To Speach - special programme for transformation of text to speach, for reading aloud. So, to attain from the programme Cool Reader an opportunity of reading aloud we need to install one of modules TTS (the most universal of them is SVOX. It can be installed free from Google Market ), and then to download into this programme one of voices for different languages. For using the voice in Google Market we need to pay, or we can take a two-week demo version. 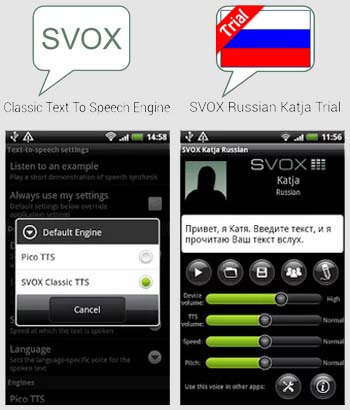 After installing these components, you need to open in settings of your Android-device an item of menu "Language and input" and then open a subparagraph "synthesis of speach" and here move the tick from PICO TTS to SVOX. After that you should return to the programme Cool Reader and turn on the mode "Read aloud". You can get more information about installing of different voices and modules TTS in forum 4PDA.RU.